The PowerBook was the first of Apple’s truly portable Mac designed to target professionals. Being the first of its kind, the PowerBook set a standard that the industry would later follow. 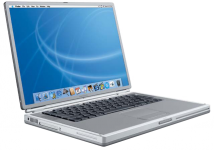 The ever-popular PowerBook was light and thing in its time and was categorized as desktop replacement computer due to its efficiency. Adding a memory upgrade will increase performance, speed and efficiency.